In case any readers were wondering, "JAWS" is my favorite modern film. Some day I will do the list that everyone else works up for their top ten, and depending on the day, "JAWS" will be either one or two on the list (because "The Adventures of Robin Hood" will have to fight for that spot as well). Five years ago, we saw "Jaws" at a screening on Sunset Blvd. at the Vista Theater. Mr. Gottlieb spoke for a couple of minutes before the movie and as the principle screenwriter for the film, we hung on every word. 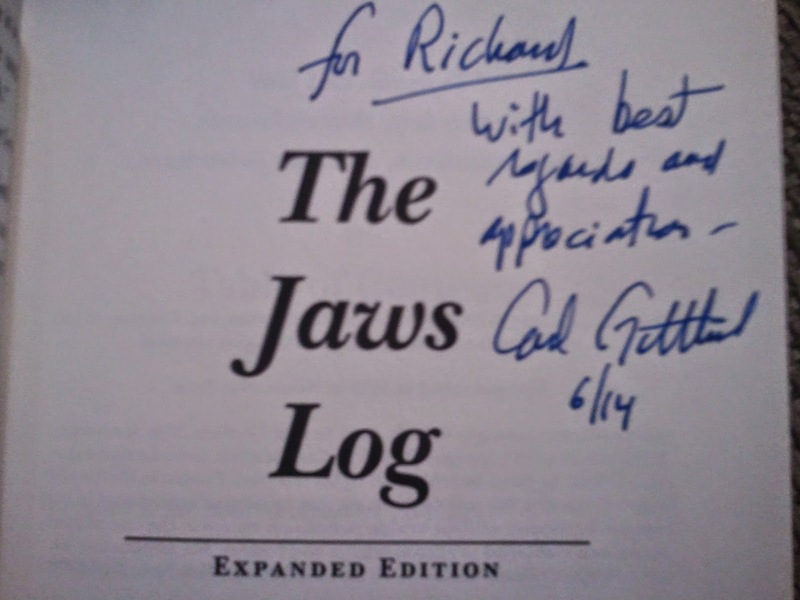 After the movie, my daughter (who is an even bigger "Jaws" fanatic than I am), had him sign her copy of "The Jaws Log", the book he wrote about his experience working on the film (he also appeared on screen as the editor of the Amity Newspaper). I did not have the foresight to go out to the shed, dig through twenty boxes of books and locate my original paperback edition, so I missed out. 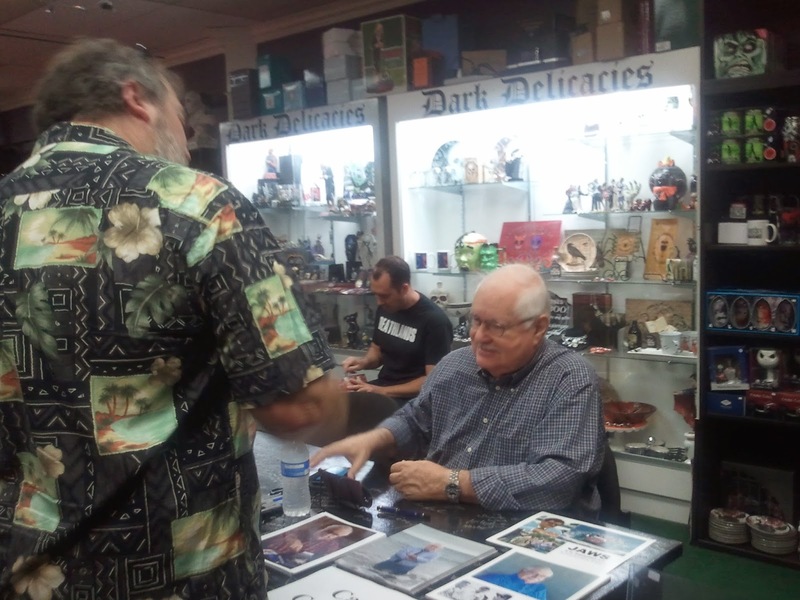 My blogging colleague at "It Rains, You Get Wet", posted a notice that Carl Gottlieb would be at an authors signing at "Dark Delicacies" a horror themed bookstore in Burbank this Saturday. After making sure I had no other conflicts, I hijacked my kid the fanatic and off we went. I'ts been years since I was in this part of town but she recognized it right away, having recently visited a vintage store that sells movie and TV castoffs. It was not hard to find, the Gothic Lettering stands out on the street. We got there a few minutes before the 2:00 starting time and they were still setting up for the dozen or so authors they were expecting for the event. As we walked in the door, there was a stack of the 30th Anniversary Edition of the book and maybe four or five of the recently expanded edition. Having no self control, we picked up two copies and went to look for the line. 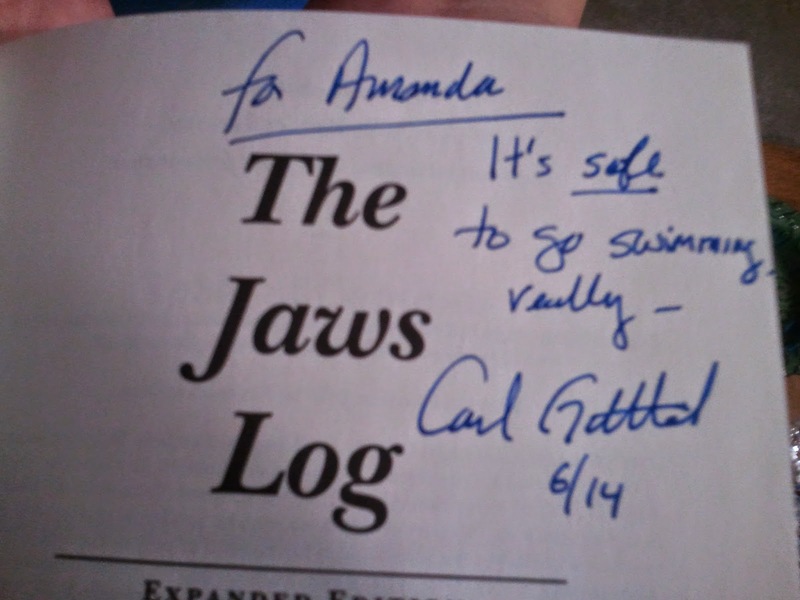 Mr. Gottlieb was the first author there, he was set up at the first spot and he was ready to go, so we did not wait. I walked up, introduced myself and shook his hand. He smiled quietly and took my book and asked me the name I would like to have him sign it to. As he was looking for the title page to inscribe, I asked if it would be alright to get a picture with him. He said "of course" and invited me behind the table. This was only possible because the other authors had not yet arrived so there was room and not a big crowd to jockey through. I happily sat down next to him and watched as he wrote in my book. I'm happy to add this to my recently growing collection of signed books. Most of them have not been personalized like this one was so I will be able to appreciate this even more. I wish I knew the horror and gaming based books that were written by the other authors today. As people were coming in they were very impressed to meet their favorites. As I said, it looked like they were set up for a dozen writers or so. The bookstore was never overcrowded but it did start to fill in and I felt fortunate that we had gotten there when we did. Since my daughter accompanied me all the way across town to keep me from being alone, I consented to purchasing another copy for her to get signed. 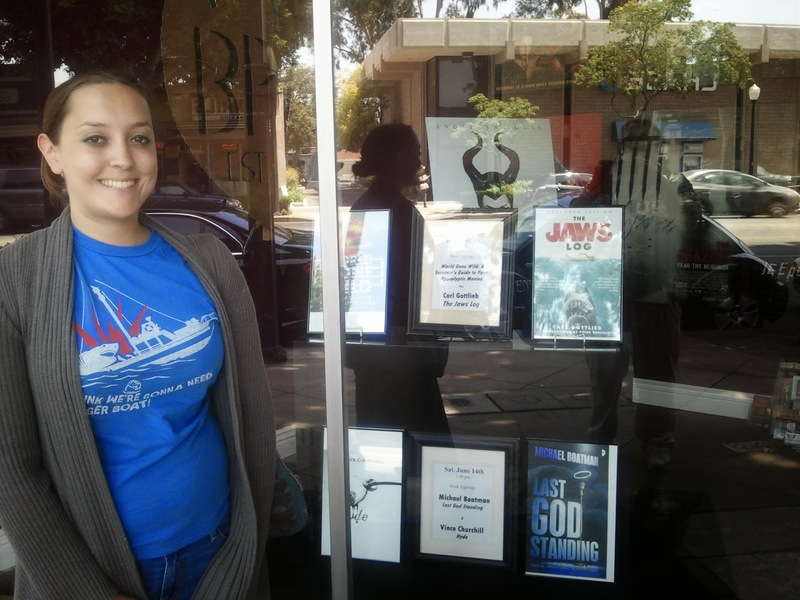 Short of going on ebay and hunting down collectibles at Christies, she is doing a good job of accumulating "Jaws" memorabilia. Here is the signature she got which is really appropriate because she does not go in the water, even as a lifelong resident of Southern California. We ended up walking down to the soda and candy store, Rocket Fizz, after our visit and found some hard to locate treats that should make the rest of the weekend just as memorable. As we walked back by the store, the shop was full of people waiting for their signatures. I noticed the sign in the window and could not resist getting one more shot for the post here. I tried to talk her into getting a souvenir key fob from the "Amity Island Motor Hotel" but she said she did not want anyone to think that she was just another of the summer ginks coming into town for the weekend. Thanks Michael for the heads up in this, sorry you missed out. Awesome! Sorry I couldn't make it, but your post of the excursion was wonderful, Richard. Took my daughter, too, awhile back for their Outer Limits: The Official Companion signing with D. Schow and J. Frentzen. 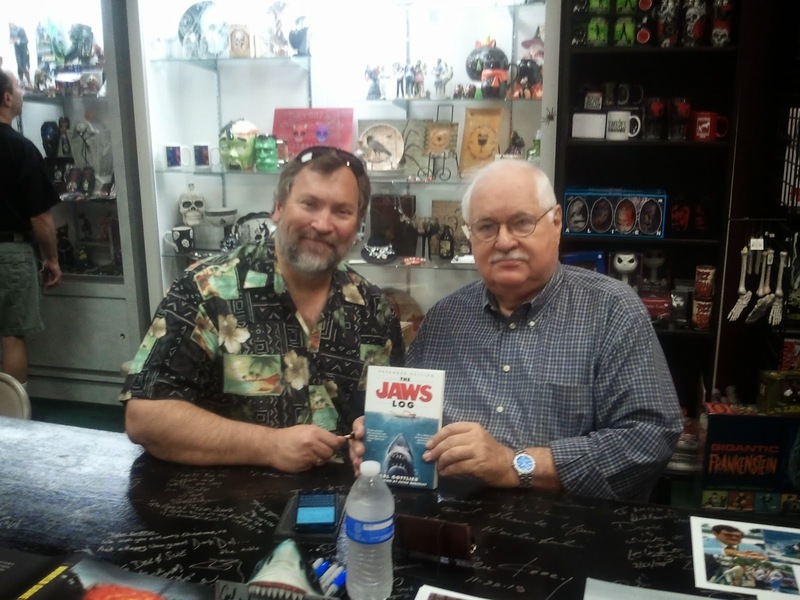 DD has great book & movie signing events. So glad you guys could make this, and Rocket Fizz! We stopped there, too. We had a nice time. I looked for you before I got your message. Thanks for letting me know about this, it was a fun afternoon. We'll hope to see you and maybe your daughter at some future event.